Hello Aspirants, looking for NCC 43 Entry recruitment Indian Army 2017 - 2018 so we have a good news for you soon Indian army will be announcing recruitment for Married/unmarried MALE and unmarried FEMALE candidates and also from Wards of Battle Casualties of Army Personnel who hold NCC C certificate can apply for this entry. 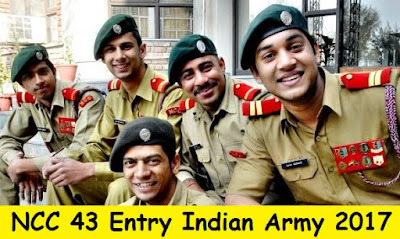 Indian Army Recruitment NCC 43 Entry. Eligible and Interested candidates can apply on or before th 2017. Feel free to ask questions below in comments. ONLINE APPLICATION WILL OPEN ON 25th JULY 2017 AT 1000 HRS AND WILL BE CLOSED ON 23rd AUGUST 2017. This was all about NCC 43 Entry 2017 Scheme . Eligible and Interested Candidates can apply online for the NCC entry 2017 from the Indian army official website. Candidates can also subscribe us to get all latest updates direct to email I'd or can follow us on Facebook for latest notifications. Feel free to ask below in comments regarding NCC 43 2017 entry.